We want them all! Which one is your favorite? Anyone addicted to coffee will tell you: this drink is a heaping dose of happy in a cup! Impossible to live without! The solution? A coffee warmer. Whether you are more conventional or more on the "funky" side, we have found two solutions that you will most certainly enjoy. Here is a coffee warmer that is all class but also works great and you'll be happy that it won't break the bank. A very popular gadget among coffee lovers, it sells like hot cakes. It will be your best ally at the office! Finally! A doughnut that does not put on the pounds! In addition to being amusing, this coaster will keep your coffee warm. It is powered by a USB cable that can connect directly into your computer. And only$15.99, difficult to say no to. Grinding your own coffee beans is an interesting olfactory experience. The smell of freshly brewed coffee can probably be described as one of the best aromas in the world! With a coffee grinder, you are able to perfectly control the fineness of your grind in accordance with the type of coffee maker you use. And did you know? Most coffee grinders can also be used to grind peppercorns, dried spices, seeds and in some cases, even nuts and fresh herbs! This electric grinder gives you lots of bang for your buck! Make fresh coffee worthy of the best baristas and preserve the aromas and flavors of coffee by reducing it to powder in the morning. No need to go to the local coffee shop ... you'll save a ton! Buy it on Amazon for$19.77. When we were kids, our parents would tell us not to play with our food ... And now, as adults, if we can allow ourselves to play around with our cups of coffee... why not?! With this creative cup, say goodbye to old, boring routines: each of your morning coffees will be different! It is even said that playing with blocks can help you relax and fend off anxiety... Your morning ritual will now allow you to start the day off right. It is available in 6 different shades on Amazon for$16.95. If you cannot afford or do not have the space for a state-of-the-art espresso machine, you can simply buy a milk frother. Portable and practical, this accessory is suitable for cappuccino and café au lait lovers. It froths your milk easily, cleans easily and allows you to compete with your favorite barista. What more can you ask for, honestly? It runs on batteries and can be carried everywhere ... even to the cottage! And it is also used for various purposes ... Your children will love getting creamy foam hot chocolate on Sunday mornings. Find it at the low cost of$17.97on Amazon. Why is this milk frother such a great seller? Because, by the simple press of a button, on the top, you can get a rich and creamy lather. Easy peasy! No bulk, no power cord and battery operated. A wonderful invention for coffee addicts! Buy it on Amazon for$18.99. We all know one or two grumpy people who are only able to smile after they've had their first good and hot cup of coffee in the morning. 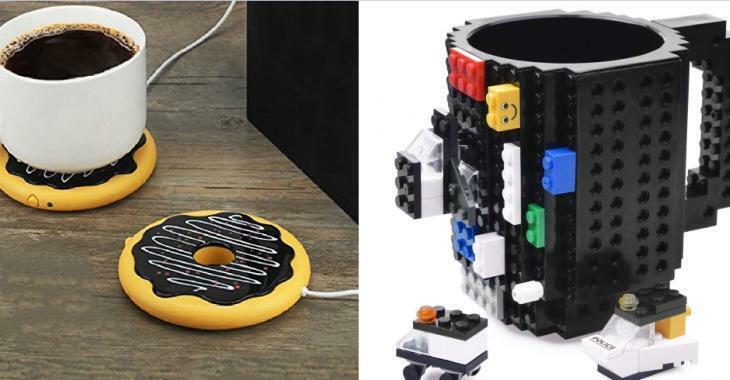 And, if in addition, this person also happens to be a bit lazy, they will love this self-mixing battery powered cup! After pouring the coffee, just add milk or cream (or a hint of Bailey's, wink-wink! ), press a button and voila! No need to run to the kitchen to find a spoon. Find it on Amazon starting from$38.85. *The content of this text contains partner links.